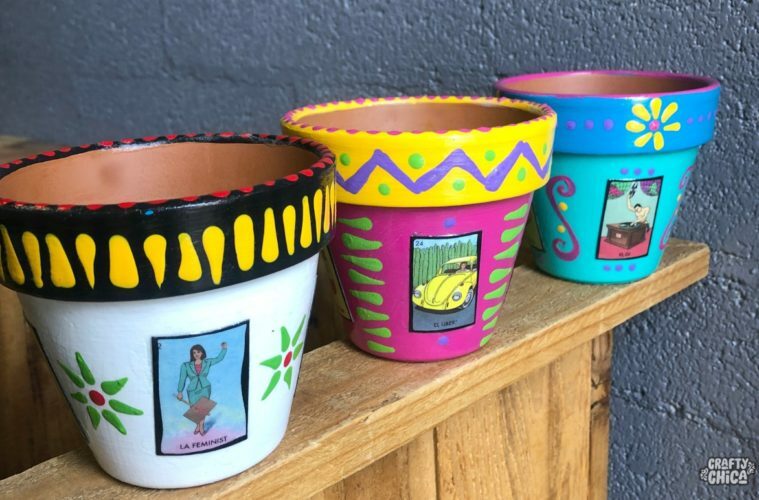 I couldn’t resist making these Millennial Loteria flower pots! If you know my history, I started my design career making Loteria flower pots and selling them to hundreds of shops around the country. I stopped because I couldn’t and didn’t want to spend every waking moment making them. 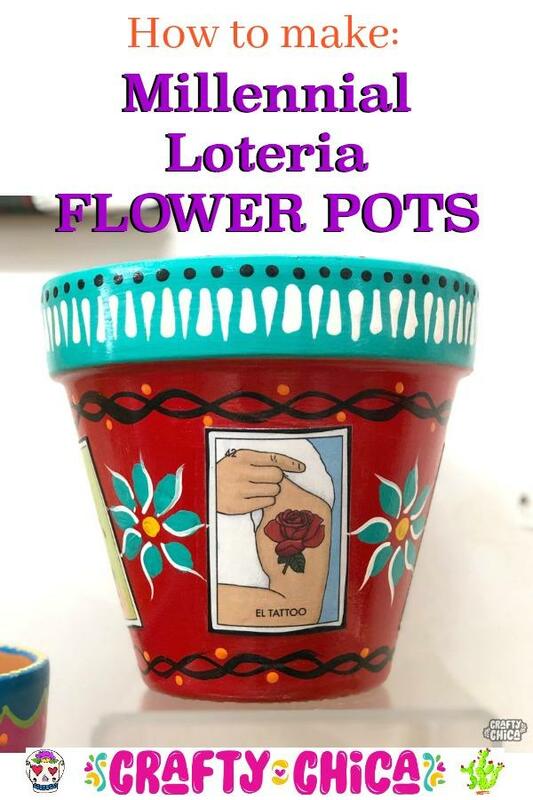 But every time I see a new Loteria version, I like to make flower pots! Millennial Loteria is a new game by designer Mike Alfaro. He reinterpreted the game through the lens of being a millennial and being Latino. GIVEAWAY: Scroll down to the end of this post to see how to enter to win a game AND a small flower pot I made with the cards! Also scroll down to see a fabulous video by Subculture Recall! Thania shows how to make a Loteria costume inspired by the game! So, yeah, I had to cut up the game HOWEVER – I suggest buying TWO games so you can craft with one and play with the other. My friends, Thania and Jose from Subculture Recall invited me over to play the game. We had pizza, burritos, wine, and snacks. Thania had never seen the game before and she had fun reading all the names on the cards. The game comes with tablets for up to ten players, the caller’s deck, bitcoins for marking your spaces, and instructions. The game is gorgeous and the cards and tablets are a high quality coated paper, very sturdy and hearty! We had a Friday night Millennial Loteria night! My finished Millennial Loteria flower pots! If you visit his Instagram, you’ll see he has new versions of the cards! Supplies: Terra cotta pots, craft paints, Mod Podge, spray varnish, white craft glue, brushes. And a box of the game! Directions: Wipe away any dust and debris from the pots. Base coat in your favorite color and let dry. Cut the game images and glue around the pot. Seal the top and edges with Mod Podge. Add painted accents. Let dry, and then add spray varnish to seal. I like to trim the pictures in paint. Thania’s outfit matched the game, so I gave her one of the flower pots! 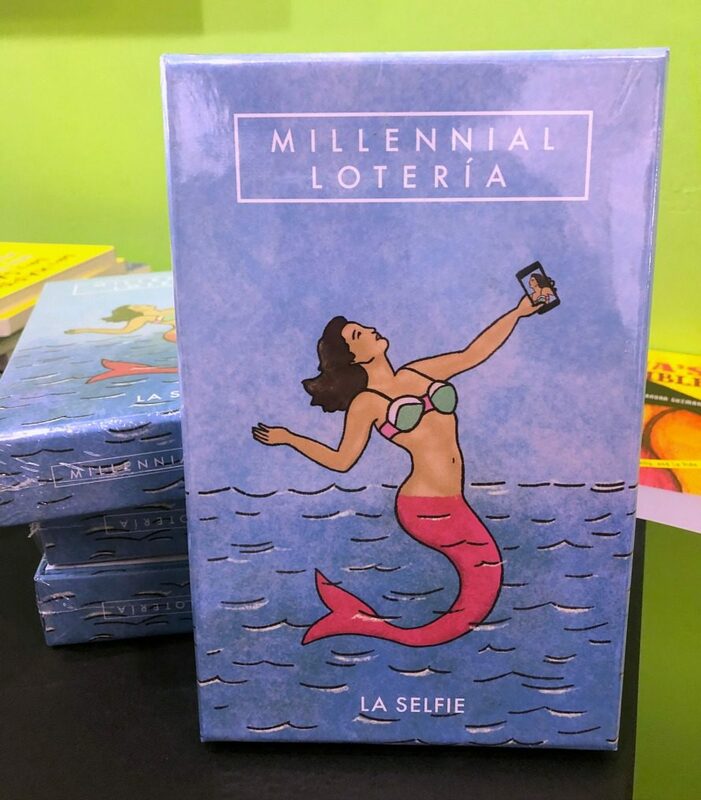 Here’s where you can buy your copies of Millennial Loteria! And check out the video where we played the game! See below to enter to win a copy of the game and one of my flower pots! Such a cute idea!! Im going to have to get my primas together and have a crafting and loteria game night. We loved playing loteria when we were little and I can see everyone crackin’ up over the new millennial loteria. I love lotteria because my momma played with us when we were little. Even some of the grand kids played with her. I have played once with my daughter’s step children. I want to keep the family tradition going. I haven’t played loteria yet but my nieces and nephew are on theit way to being bilingual. It would be divertido for us all to learn together.